Daniel Pon loves Steampunk. 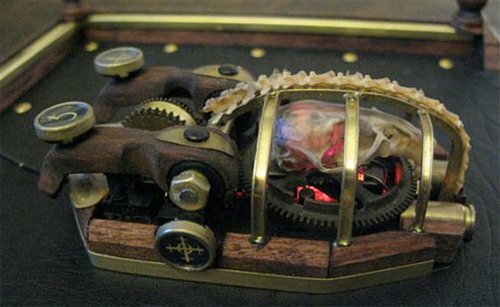 So when it came time to make a steampunk mouse to go with his Steampunk keyboard and monitor, he went a little crazy with the design. The end result? 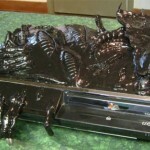 Pretty damn cool. And maybe a bit morbid. 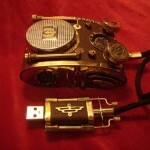 The Paradox Mouse is a great steampunk mod with typical brass, bolts, gears, wood, etc. A great neo-Victorian peripheral. But it has a few extra features that Daniel calls “ironic”. These features are a real mouse skull, shoulder blades and spine, all lovingly worked into the project. 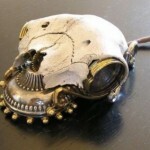 The skull sits on the front of the mouse, the shoulder blades as miniature cattle catchers, and the spine as the palmrest. He’s dedicated. We have to give him that. I had to soak the bone in warm water for 5 minutes to soften the tendons which allowed me to bend it to its final shape. I’m scared that Daniel has bones just laying around the house.